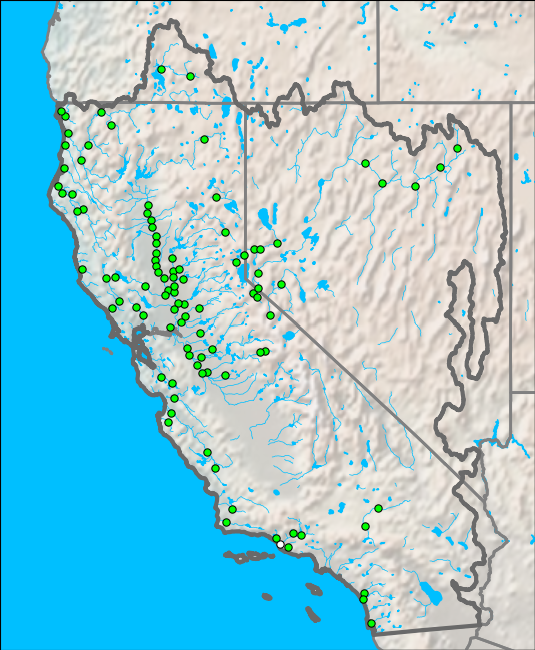 A summary of over 1000 river and reservoir stations located throughout southern Oregon, California, and Nevada displayed on an interactive map interface. Data are available for the current hour, as well as the past 1, 2, and 3 hours. Data are updated every 10 minutes between 16 and 56 past the top of the hour. Also, KML files are available for download and use in Google™ Earth. A summary of river stages for the past 5 Hours updated 19, 29, and 49 minutes past the hour. The map below represents current river stage and flow information for the CNRFC River Guidance (Flood Forecast Points). To view the latest data for any of these locations, place cusor over the desired gage on the map for a readout. Click on a location to view the text product summary (RR8) of river stages for the past 5 hours. NOTE 1: Observed river stage / flow data may be up to 4 hours old and still be considered "current". NOTE 2: Plotted data is provisional and from automated gages. The data has not been screened or verified for accuracy.